Her eyes watched the tom closely, a slight grin on her face as he went. Climbing was never exactly her strong suit but she was quite a bit smaller than the tom making his way up so maybe she would be able to do it without scaring all the birds in the forest, yea? Once he had finally made his way up and called down to her Eveningstep took a deep breath, staring at her paws to ensure she had good balance on the dirt. Finally she kicked up, digging her clawns into the bark and slowly dragging her body up further and further until she reached the branch that the tom had settled on. While she wasn't winded, and he silky fur stayed basically completely in place through the whole adventure, Eveningstep looked down at the forest floor below them and shuddered, she wasnt a fan of heights. She took a deep breath, removing her eyes from the deadly fall and letting them skim over Stormfrost onto the sky just above them. He was right, it was an absolutely beautiful view, clear of any branches that might be in her way to seeing the glimmering stars, wondering if her parents were watching down on her. "It's gorgeous, thats for sure.." She whispered, looking back at him once again, yellow eyes bright. "So what're these patterns you wish to show me?" stormfrost watched with concern as eveningstep shimmied up the branch, much more gracefully than he could ever attempt. he visibly relaxed upon the lean she-cat joined him upon the branch, and he followed her drifting gaze as it fell to the steep drop below. before His usual awkwardness could cloud his judgement, the burly tomcat gently brushed his tail against her shoulder blade, his husky voice a mere whisper as he spoke. "don't worry. i'm here for you." as soon as the words left his lips, the tomcat recoiled, and if cats could blush he'd most certainly be a deep shade of red by now. clearing his throat, he quickly shifted his eyes away from eveningstep and glanced up at the velvety sky above. already a deep and inky black splashed most of silverpelt, melding to an almost pallid blue at the very point of the horizon. a few stars glimmered above, their twinkle sharp against the darkness. he'd spent many moons surveying the night sky on his own. he loved the relaxing swamp that was twilight, and as an almost playful game he'd pretend to find shapes within the scattered sprinkling of stars. "see that?" he pointed a hooked talon at a few pinpoints of light, their dots awkwardly aligned in what rather looked like a rabbit..."It looks like a piece of prey, doesn't it? maybe it's running away from something." he paused. then, with another awkward clearing of his throat, he added, "alright, maybe this is stupid...but what if silverpelt is one big window into the doors of starclan? maybe these so called arrangement of stars are just a fraction of a glimpse into a word so much bigger than our own..."
The black she-cat gave a small smile at the toms words, it was a cute gesture and while Eveningstep was not exactly a fan of heights she wasn't all too sure Stormfrost could save her from falling. Thats why cats landed on their paws though, right? Either way, she fluffed her fur out to keep the heat in during the night chill and watched as he pointed out the sky. "I like to think that where the cats of Starclan roam is full of different adventures, one suited to each of their passions, y'know?" She whispered, a light purr coming from her throat. Half the time she felt as though it was all a reward, serving your clan long enough that you get this prize at the end. You get to live with those you love all while doing what you love, it was definitely a dream for the skittish she-cat. Who knows what her life would be filled with when she ended up there, would she see her parents again? Would her brother join her? Would she have a family of her own to come and be with her in the future? These were all questions she thought of often, yet right now she had to be in the present. stormfrost flicked an ear, his eyes still fixed on the shimmering dots high above, each twinkle its own warrior, each speck its own story to tell. the sky was like a map, particularly at night, the heavens holding so many tales and secrets, of cats long gone, of a history told many ancient upon ancient moons ago. without meaning too he brushed closer to eveningstep, relishing in the radiating warmth from her fur, a happy purr building deep in his maw. sharing this peaceful moment lent the tom a rare, almost uncharacteristic courage, as he pressed his flank closer to hers and listened to her soft voice. "i like to think that's where the cats of starclan roam is full of different adventures, one suited for each of their passions, y'know?" he nodded slowly, turning her words over and over again in her mind, and he wondered, if he were to walk in starclan right now, what would he be doing? he had thought much about life after death, and he'd never been able to settle on an adequite answer - but that was the beauty of conversations like these, there was no discernible end, no way to uncover the truth. all that lay ahead was theories stacked upon theories, and stormfrost loved the thrill of the unobtainable more than anything. "what would you do up there then?" he murmured, genuinely curious. "as for me..." he strained his thoughts, green eyes narrowing, and he wondered, just what made him happiest in life? some might answer that hunting and patrolling brought them joy, but that wasn't it for stormfrost. he wasn't an ambitious tom either, being of high status was no concern to him at all. "yes. being near with the ones i was closest to in life. i think that's what starclan would be for me." Grinning just slightly Eveningstep shut her eyes, a small purr coming from her throat. What would she be doing up there? It was no question to the orphaned she-cat, she would be with her parents once more. Their deaths threw the once hyper and active apprentice into the skittish creature of today. Her brother tried so hard and she cannot blame him for the failure, he got her through training and thats more than she could have asked for. "I'd like to think I'd be with my family as well, seeing my father again, my brother with me, see my mother for the first time. My father always said she was a lovely she-cat, I'd like to meet her. Being with my loved ones is my idea after life." She spoke with such confidence, unknown to Eveningstep for all the time she had been a warrior. This was truly something she hoped to have happen. "I suppose its not so different from yours is it?" 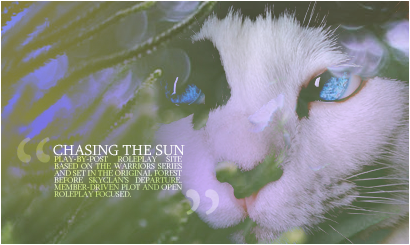 The black she-cat opened her eyes once more, yellow orbs landing on the blue-gray tom beside her. "If we are lucky perhaps we will see each other up there hm?" a pang revereberated within his breast at the mention of a mother she'd never even graced eyes upon. at least he could recall his skin, from the slightest tang of their scent to the gentle brush of their fur. and even if batwing was an awful addition to shadowclan, at least he had the pleasure of saying that, indeed, his cousin was alive and kicking...if one could call that a pleasure, ugh. meadow shaded eyes fixed upon the way her fur fell off a lithe and sinewy form in drapes, a curtain of obsidian against a lean stature and blazing orange eyes. her sweet musk wrapped him in a tender wreathe, drawing him even closer, closer, until his plume of a gray tail had rested gently upon her shoulders. he allowed his dark nose to brush the fluff of her ear, controlled his breath until it emerged in symphony with her own. "i'm sure we'll see each other there," came the stoic tom's lulling murmur. "in fact...you're the one i'd most want to see there." wait - was that too fast? his heart stumbled, tripped, and quickly he drew back, unsure if she appreciated the intimate touch or not. quickly stormfrost glanced away, shame and heat flooding hot to the sullen circles of his cheeks. stormfrost had always been the eloquent, romantic type...but perhaps eveningstep wanted nothing more than a simple friendship from him. which he was perfectly fine with too, of course - he could take rejection! psh, it wouldn't ruffle him in the slightest! ...somehow, he doubted this, but his countenance betrayed not a glint of anxiety. Eveningstep had returned her gaze to the sky, ears flicking every so often after she had finished speaking. Her mind was reeling at the thought of seeing a family that she herself never laid eyes on. 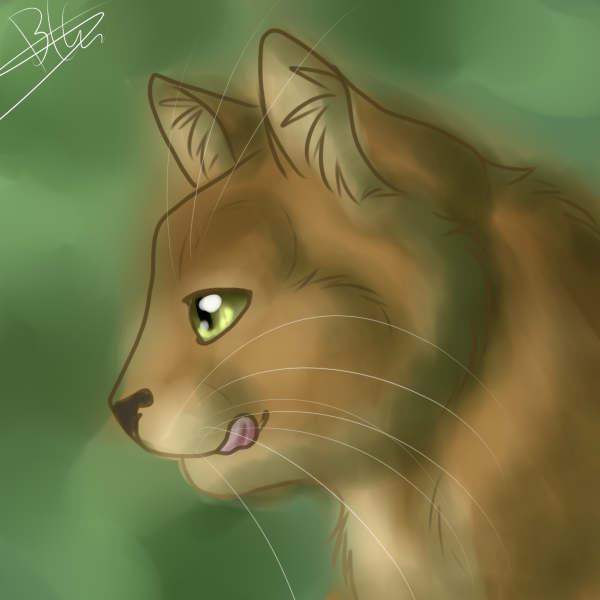 It would be a true test to starclan, just to see if they truly are there. If she could see her mother and really see her, then maybe what they say is true and it doesnt matter if you've known the cat in your life or not. She really hoped so, that was for sure. The ebony molly flinched just slightly at the feeling of Stormfrost's tail, sliding up her back and just over her shoulders, though quickly she relaxed, a small smile gracing her features. It was a feeling of hope that she hadn't felt much in her life at all, her amber gaze returning to his face just as he finished his words, watching him pull away and seem to lean back in what appeared to be shame to her. "Maybe they will listen to both of our hopes then." She purred, leaning over just enough to let her fur brush his, not wanting to ruin any balance either cat had. 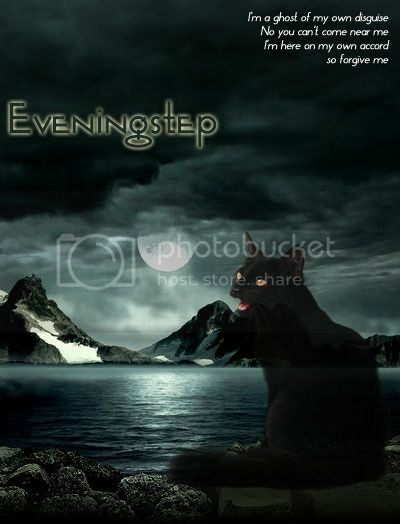 Eveningstep had never truly had a romantic relationship and it wasn't something she often thought of, being the cat that ran at the smallest snap of a twig. Yet, Stormfrost made her feel comfortable and wanted, he made her feel safe as though whatever crushed that twig under its paw couldn't touch her. This was a feeling she hoped he would never rip away from her.